July 2017 - Informs Inc.
New Serving Sizes Serving sizes have been recalculated to more closely reflect the amounts people usually consume at a single sitting. For example, the serving size of ice cream changed from 1/2 cup to 2/3 cup per serving. As a result, a pint of ice cream now represents 3 servings as compared to 4 servings under the prior calculations (now there’s a change that probably won’t get any pushback!). For package sizes that contain more than a defined single serving but that could be eaten in a single sitting, the label must call out both the “per serving” and “per package” information. The change in serving sizes affects items such as soft drinks that are packed in both 12- and 20-ounce containers. Both sizes are now considered a single serving since people typically consume the entire container at a sitting. As such, the values of the entire container must be used to calculate the nutritional values. 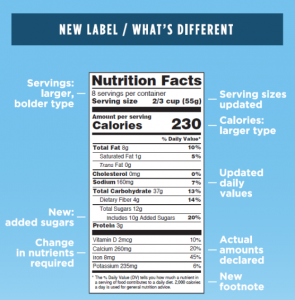 Larger Print Size for Key Info Serving sizes and calories per serving must now be printed in a larger, bolder font than previously required. This helps consumers to recognize the impact of food choices on their weight and health. New Callout for Added Sugars Health experts recognize that it is difficult to consume the entire range of required nutrients and still stay within the recommended calorie intake if added sugars exceed 10 percent of a day’s calories. To help keep consumers aware of the amount of added sugars in a food, sugars added during food processing or packaged as sugars must be accounted for on the label. Change in Required Nutrients List The new label requires that amounts of potassium and Vitamin D be called out along with calcium and iron. These nutrients are often lacking in American diets. Manufacturers are no longer required to list vitamins A and C since deficiencies of these nutrients seldom occur. Updated Daily Values Based on the newest research, nutrient values for sodium, dietary fiber, and Vitamin D have been revised. These are the amounts used to calculate the % daily value and serve to help consumers understand a food’s impact on their overall daily diet. Calories from Fat The label must still include valued for total fat, trans fat, and saturated fat, but the “total calories from fat” requirement has been removed because research shows that when it comes to health, the type of fat is more important than the total fat consumed. It’s important to be aware of and begin planning for these changes. We’re here to help make the planning process simple, and recommend labeling requirements and practices to ensure your success. 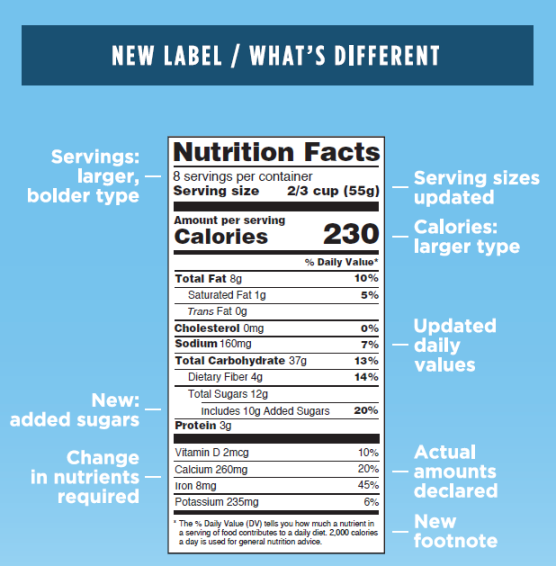 For more information on creating a healthy nutrition facts label on your products, check out our blog titled 4 Common Food Label Violations + How to Avoid Them. Your material handlers need to be constantly on the move to ensure the productivity and efficiency necessary to compete in today’s tough competitive environment. 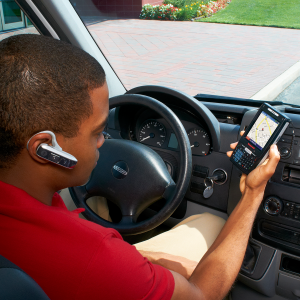 The most important decision you can make toward mobilizing your workforce is to equip them with data collection devices that enable them to quickly and accurately scan goods. Follow this simple, three-step approach and you will be well on your way to scoring the lower costs, greater worker productivity and a variety of other benefits of a mobilized workforce. There are dozens of possible hardware and software configurations, with any number of options that can take your environment to maximum efficiency or—if you choose a device that doesn’t quite meet your needs—maximum hassles. Depending on your environment and your applications, you will want to ensure you choose the right device(s). For an industrial environment, you may need something more ruggedized to handle a number of users and multiple shifts, for example. Or maybe you need a handheld mobile computer for picking and packing applications that is responsive, easy-to-use and light weight. Above all, start with a plan that outlines the needs of each area in your warehouse and build a wish list to identify the features that you need most. Even after you think you know exactly which devices are best for you, it still makes sense to work with an expert to help you identify the various makes and models that match those features. A value-added reseller (VAR) can offer advice and guidance that you may not always get from a web search, they most likely will have plenty of hands-on experience with applications just like yours, and they may have insight about particular models or manufacturers that work best in your environment. Don’t hesitate to ask for references and on-site meeting to get familiar with their skill set. While it may seem as though an online purchase is easy and cost effective, in the long run, it may be a poor choice. If you are making your initial transition from a manual to an automated process, you will want a technical advisor to assist with systems integration, network set-up, device configuration and security. A VAR with experience in your industry is more valuable to you than a generalist because they will understand the many unique requirements you have. At Informs, our average sales associate has 16 years of data collection industry experience, so you can be assured they have seen it all and are familiar with best practices. While most devices will operate trouble-free, users may need training, have questions or concerns. It pays to have a trusted advisor on your side to help you resolve any issues. At Informs, we understand the technology and the complexities of data collection. We know how to troubleshoot your entire system. In fact, we have a dedicated helpdesk for quick solutions to hardware issues. With an online retailer, you just won’t get the level of support that is needed – when you need it. The savings you might gain by purchasing online will end up costing more in the end in terms of downtime and lack of resource when trying to get even the simplest of issues resolved. With an experienced partner like us, you get seamless deployment, integration, and service. If you’re interested in learning more about the best ways to mobilize your workforce, you can get started today with a free, no-obligation consultation loaded with free advice to get you started. Contact us today.